BenQ America Corp., is sponsoring the "The Aurora Project" — a free outdoor contemporary art exhibit held in Dallas on October 15 to 18, 2013. 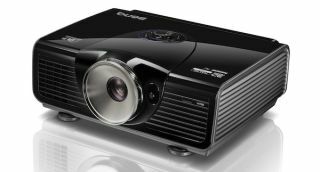 Providing a total of sixty Colorific projectors to the cross-genre event, BenQ is continuing its commitment to the visual arts community — providing mixed-media artists and curators with projectors that blend both ease-of-use and market-leading color quality to bring today's most daring creative visions to life. Held within the rapidly developing Dallas Arts District, The Aurora Project stages interactive new media projects involving light, video, performance, and sound set in exciting and unexpected public places. For two nights, the event will transform Dallas' 68-acre downtown core into one of the nation's largest outdoor exhibitions of contemporary art, featuring collaborations between hundreds of local, national, and international artists. "BenQ is excited about being a new member of the Dallas community, and we are thrilled to lend our support to Aurora 2013," said Jan Spence, director, marketing communications at BenQ America Corp. "By developing projectors that provide spectacular image quality, a growing number of curators and artists are turning to our technology for their creative projects. With the ability to cast over one billion stunning colors in a variety of setups and lighting scenarios, our Colorific projectors are specifically equipped to push the boundaries of the imagination, inspiring audiences through the magic of larger-than-life installations." Designed for visual display projects such as art projection installations that require prolonged image projection, BenQ's Colorific projectors deliver more than one billion stunning colors, higher contrast ratios, and longer-lasting image quality over extended usage. As a result, projection installations gain more stable pictures with richer blacks, more luminescent whites, and a crisper overall projection experience. Thanks to their high contrast ratios, BenQ projectors also deliver sharper picture quality, which enables the reproduction of finely detailed images in a variety of ambient lighting settings, and adds to the flexibility of the projectors' installation options. "Within the arts community, BenQ is increasingly contributing as a patron of innovative projected visual art, supporting a number of important exhibits and events across the country," said Spence. "As today's mixed media artists seek simple ways to unleash their creative visions, BenQ projectors provide an appealing combination of reliability, durability, and immaculate performance to ensure that image quality is sustained over long projection periods." Projectors selected for "The Aurora Project" exhibition include BenQ's W7000, W1070, EP920, and short-throw MW851US T and MW860UST devices.